The creators of a street food television show and iPhone app are looking for new vendors to feature. Paperny Films and Invoke Media, the partnership behind Eat St., say that they’ve built “the most comprehensive list of street food vendors in North America,” and are hoping to see it continue to grow. 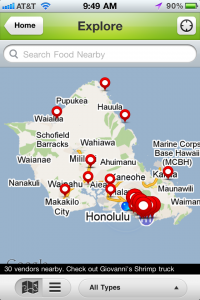 The Eat St. mobile app (see my review on Nonstop Honolulu), which marked 100,000 downloads a few weeks ago [PDF], helps vendors connect with their customers and helps customers find vendors anywhere in North America. It features full profiles of each vendor who signs up, including location, type of food, hours of operation, menus, specials and Twitter feeds. Street food vendors, including food truck owners, are encouraged to claim their businesses in the database. As for the television show, Eat St. consistently ranked among the top 10 programs on Food Network Canada. The show airs Wednesdays at 9:30pm ET/10:30pm PT on Food Network Canada and Tuesdays at 8PM ET on The Cooking Channel in the United States. Producers hope Season 2 will feature vendors in Hawaii, Brooklyn, Philadelphia, Florida, Georgia, California, Portland, the Midwest, and Canada. This entry was posted in Food Trucks, News. Bookmark the permalink.